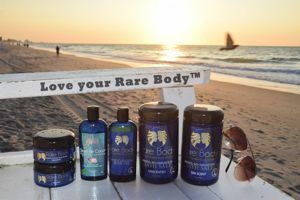 Rare Body® - continues the way Jacques reinvented the reputation of sea salt. Colette Delangre, one of Jacques’ granddaughters, got the idea to use the Celtic Sea Salt® as a bath product. She realized that having her sister, Carla Delangre, and her cousin, Stephanie Tomatis, as partners could only strengthen the opportunity. The three are here to reinvent the way we all care for our bodies. Rare bodies... Love your Rare body.